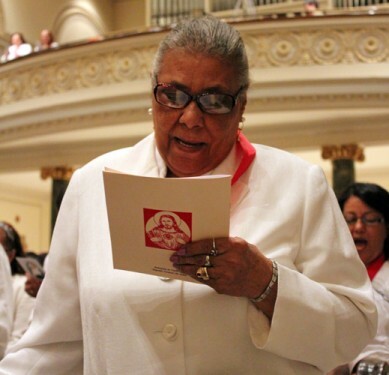 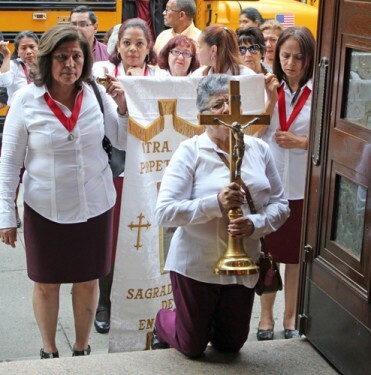 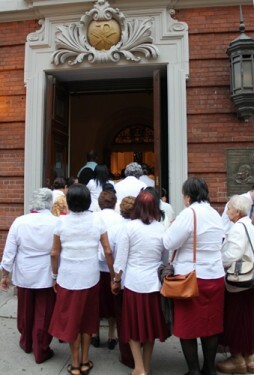 More than 500 women from the Cofradías Del Sagrado Corazón de Jesús streamed through the Holy Doors of St. James Cathedral Basilica, Downtown Brooklyn, on their way to celebrate the feast of Jesus’ Most Sacred Heart on Friday, June 3. 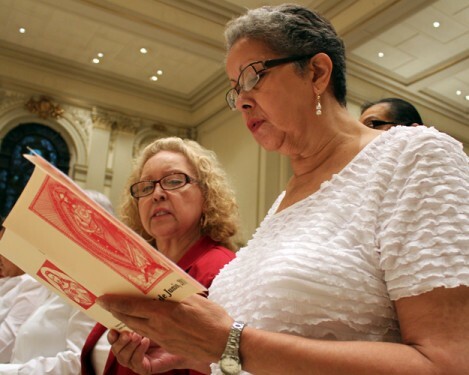 An annual observance for the diocesan Confraternity of the Sacred Heart, the feast-day devotion took on added meaning with a pilgrimage to the cathedral for the Holy Year of Mercy. These sisters in the Heart of Christ not only renewed their dedication to Him, but also sought His mercy. 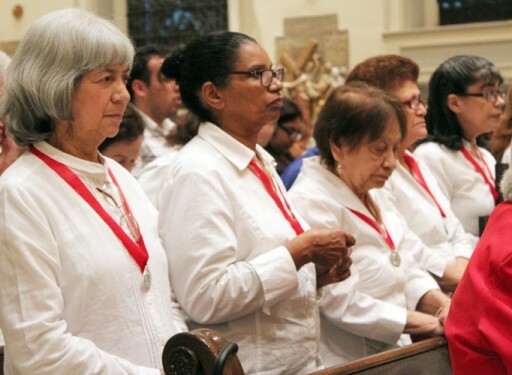 Auxiliary Bishop Octavio Cisneros, diocesan vicar for Hispanic Concerns, welcomed the women, along with their husbands and children, to recite the rosary, pass through the designated doors and celebrate Mass in Spanish. 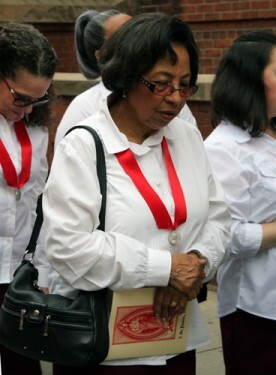 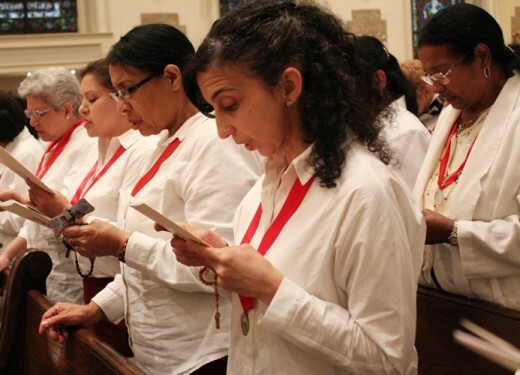 About 30 women from 13 parishes were consecrated to the Sacred Heart during the liturgy. 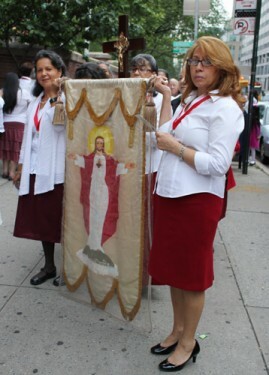 Carrying banners, parish groups walked in procession through the doors behind the bishop. 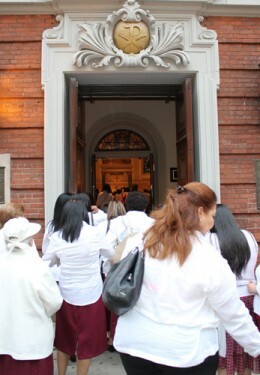 Some paused to make the Sign of the Cross, while others knelt in the doorway offering silent prayers. 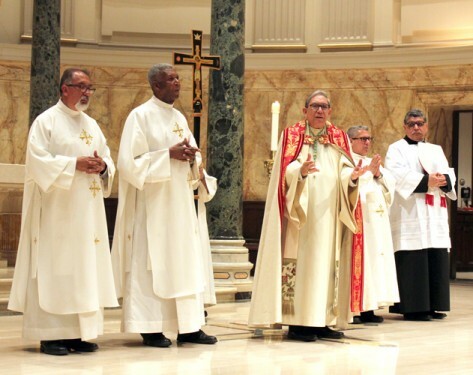 “Pope Francis said that [going] through the Holy Door is a symbol of conversion, a change within us, remembering that we must also keep open the door of our hearts,” the bishop later said in his homily. 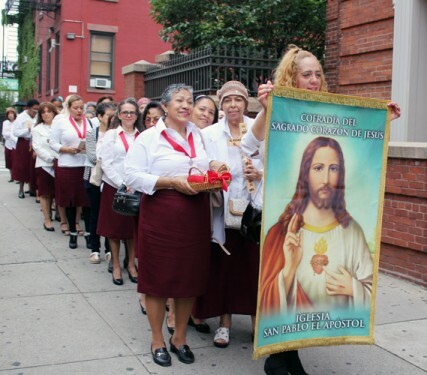 Catholics believe it was Christ Himself who requested devotion to His Sacred Heart several centuries ago when He appeared to St. Margaret Mary Alacoque, a French Visitation nun. 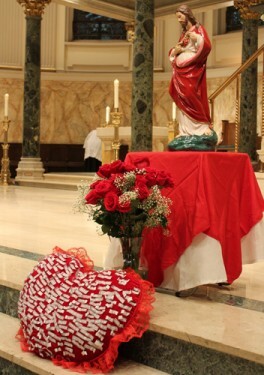 His Heart was crowned with a cross, encircled with thorns and aflame with love. 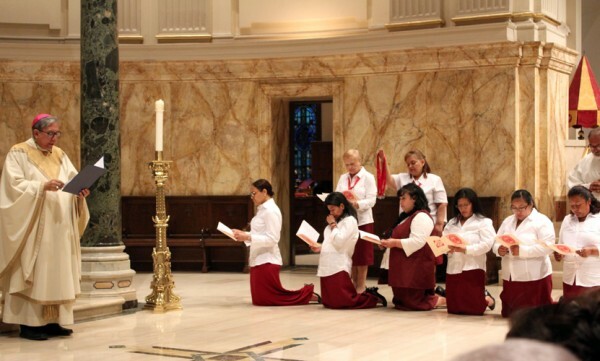 He asked the faithful to honor His Heart through acts of consecration, reparation and devotion. 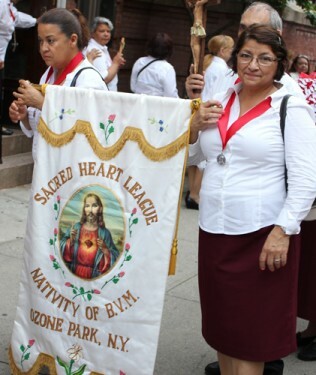 For most members of the society, this love for the Sacred Heart was instilled at home among their families. 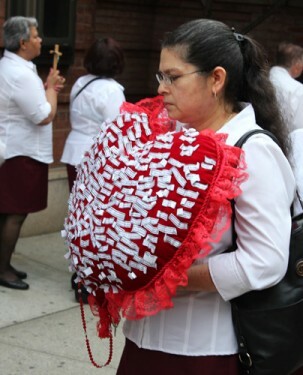 Some were consecrated in their native countries, like their mothers and grandmothers before them. 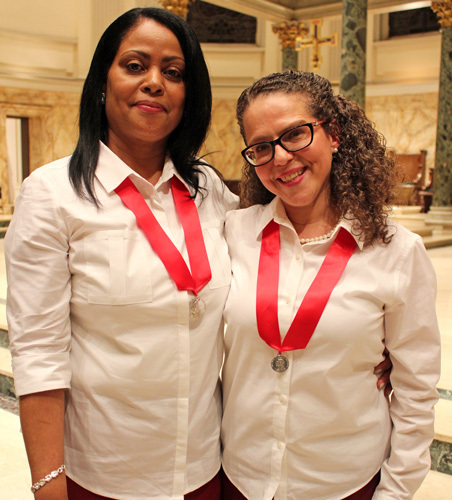 Others found this sisterhood in their parishes. 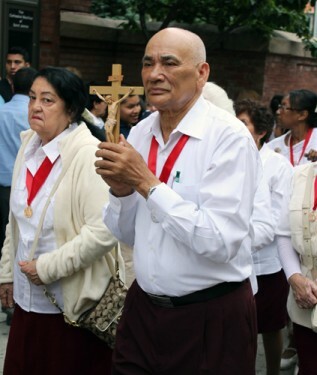 Cofradías have been bringing Christ to others in the Diocese of Brooklyn for nearly five decades. 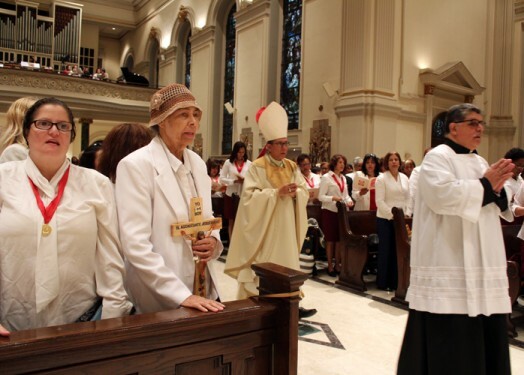 In recent year, Bishop Cisneros appointed a diocesan team to lead parish-based groups. 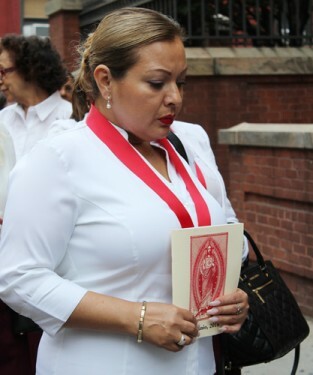 Deacon Ruben Siavichay is the spiritual leader, Casilda Noboa is a religious advisor and Rose Santisteban serves as president. 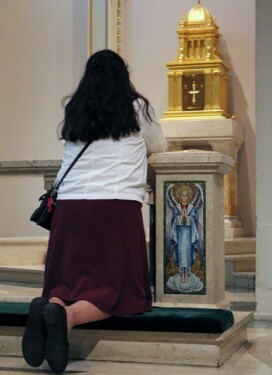 Praying for seminarians and vocation is the main purpose of the cofradías, and they meet regularly for Masses, holy hours and novenas. 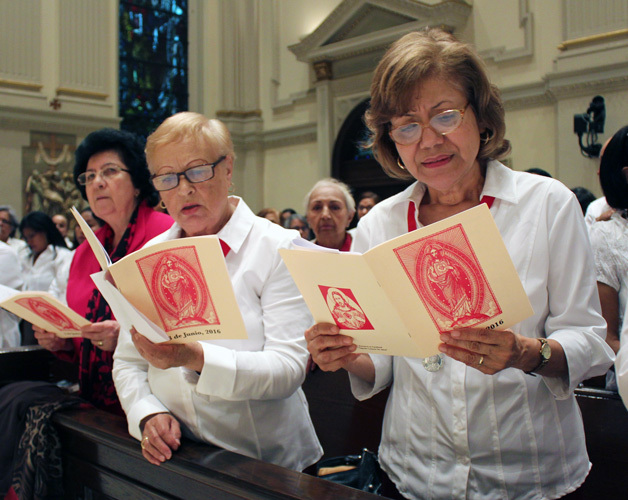 The two main events are an annual retreat and the feast-day Mass. 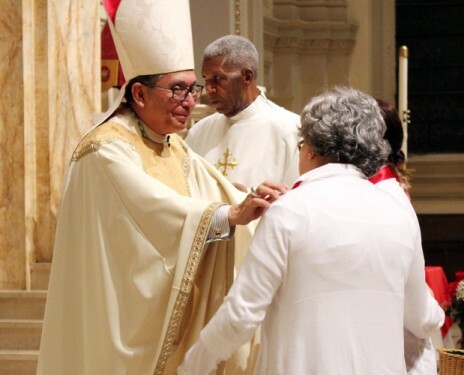 Roman, who was consecrated at the Mass, was humbled by Bishop Cisneros’ words. 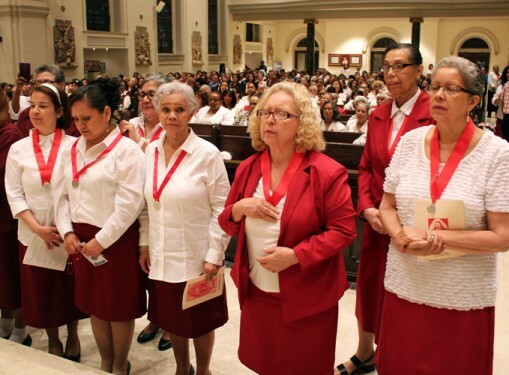 Prominent among the congregation at the cathedral last Friday evening were women from St. Paul the Apostle, Corona. 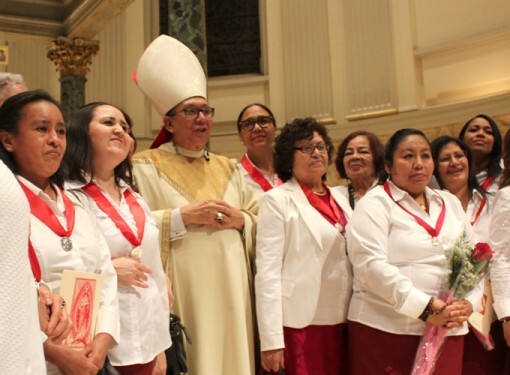 It is the newest cofradía in the diocese, formed in the last few years under the direction of Rose Batista, society president. 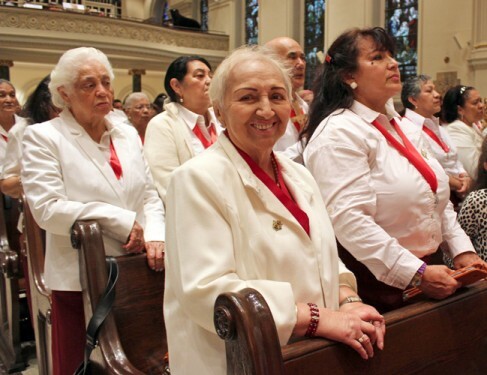 Meeting Batista and joining the society has changed Juana Filpo’s life. 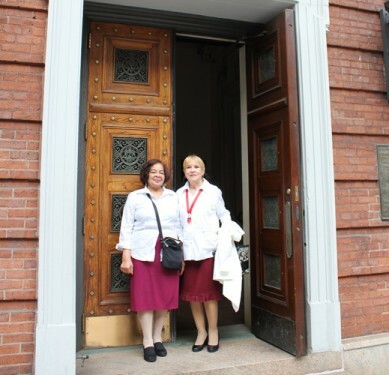 With Batista’s support and eventually that of the other women in the group, Filpo had the courage to put her depression and pain in Christ’s Heart, and He has renewed her spirit. 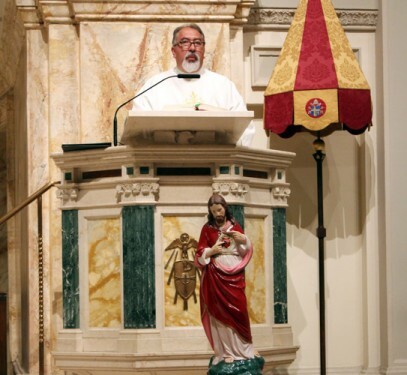 At the end of Mass, Bishop Cisneros stood on the altar and thrice repeated the words: “Sagrado Corazón de Jesús” (“Sacred Heart of Jesus”). 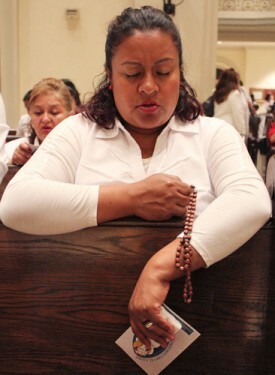 The entire congregation said thrice in reply: “En Vos confío” (“I trust in You”).